The mountains of North Carolina suffer under the fog that is Asheville, NC. Asheville gets the headlines. Asheville has the breweries, the restaurants, the Biltmore, the unnecessary and overrated gourmet potato chips, the crowds, and the perception of being hip in the very unhip Carolina mountains. It’s the popular mountain town that people from outside the state have actually heard of. But, if you’re lucky, you know about smaller towns in the mountains. I like Hendersonville. It’s what I imagine Asheville to have been before Asheville became overrun with glassblowers, and 1960s reenactors. It’s a small mountain town with a nice main street with a lot of choices for food and drinks. My interest in Hendersonville grew so much that I have considered moving to Henderson. Eventually, I actually stopped telling people about Hendersonville, for fear that I would single handedly cause of diaspora of people to the town, and it would become another Asheville. Luckily, I don’t think there’s any danger of that happening; there’s no Biltmore, no colleges, no large conference centers. But it could get larger – too large for my tastes, because while it may not have the large scale features that typically attract large crowds, it does have all the small mountain quaintness that gets people to pull off the highway and check it out. This day I stopped into Mike’s On Main for lunch. Set up in a 1950s style, the restaurant, thankfully, does not rest on its affected appearance. It’s a legitimate diner that makes legitimate food. If you like the 1950s style, and many do based on the crowd that was in the restaurant this day, you’ll love this place. If you don’t care if there’s old Coca-Cola signs on the wall, or goth artwork, as long as the food is good, I think you’ll like this place too. Which is why I continue to go back there. That’s not to say I’m really challenging Mike’s on Main. 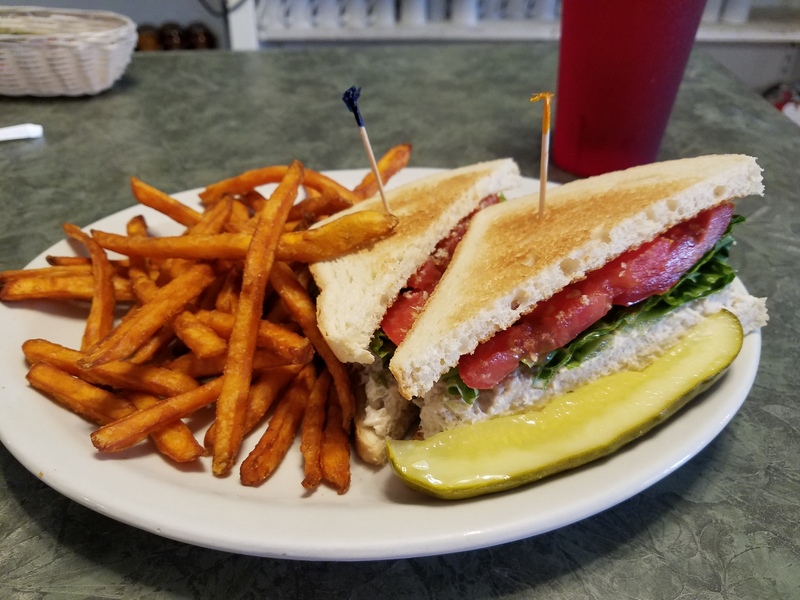 I ordered a tuna salad sandwich on toasted white bread, with lettuce and tomatoes, no cheese, and a side of sweet potato fries. Not exactly a challenge, but you’d be surprised how many places across the state manage to mess this simple lunch up. Soggy tuna? Flavorless tuna? Barely toasted bread that comes out already cooled? Mustard on a tuna salad sandwich? There are many ways to ruin a simple sandwich, and I’ve choked down enough of them. And THAT is why when I’m in the Hendersonville area, I know where I can go.